“It’s never too late to be what you might have been.” English Victorian novelist Mary Ann Evans, who used the pen name George Eliot, wrote that more than 150 years ago, but she could have been describing Danny Collins. This is the story of a man who traded his family and his life for musical success – and now has decided to see if it’s possible to trade back. It’s a better story than it is a movie although you’ve got to love a film where the opening credits read: “The following is kind of based on a true story a little bit.” The problem is – it loads the cast with accomplished actors and then doesn’t trust itself enough to believe the audience will stay engaged in its central plot. As it is, it’s charming but chatty, different (Pacino sings!) but sometimes draggy, and has a confident sense of purpose but often lacks a sense of direction. Best of all, it has Al Pacino in the lead — and with boozy confidence and bleary eyes, he struts and swaggers and convinces us to care about his life. There are lots of morals tucked in here – and parts are lots of fun. 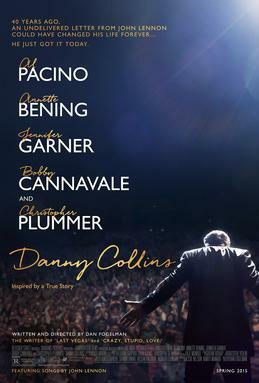 Danny Collins (Al Pacino) is an aging rock star who’s just going through the motions. On his birthday, his manager (Christopher Plummer) gives him an undelivered letter from John Lennon to Danny, sent forty years ago. It advises him to “stay true to your music. Stay true to yourself.” Danny knows he’s done neither and so he fuels up his jet and flies off to New Jersey, to meet the son he never knew and find the life he gave away. The movie has a lot to say about inserting ourselves where we’re not wanted, about our inability to go home again, about the naiveté of expecting others to forgive and forget. You just have to wonder: did we need to spend so much time in a school for problem children; did we need to have a family crisis that provides good emotional moments, but feels unnecessarily grafted on? Overall, “Danny Collins” carries well the spirit and courage of an independent film; it doesn’t settle for the easiest solutions, but with the talent it has on board, it feels like it could have told its story better with a sharper and tighter focus on the story it was trying to tell.